AFCON - Which is the most exciting group? 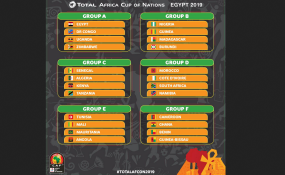 Egypt-Zimbabwe will be the opening match of this Total AFCON 2019. The draw has reached its verdict. The Pharaohs, in Group A, will face the Leopards of the DRC, the Cranes of Uganda and the Warriors of Zimbabwe. In Group B, the Nigerian Super Eagles will face two teams that qualified for the first time at this AFCON: Burundi and Madagascar. Not to mention the National Sily of Guinea. One of the tournament's favorites, Sadio Mané's Senegal, will play in Group C against Tanzania and Kenya. The Algerian Fennecs will be the other favorite team in this group. In Group E, the Carthage Eagles will face the Mali Eagles and the Mauritania Muribitoun, for whom this is their first participation in the CAN, and Angola. Read the original article on CAF. Copyright © 2019 Confederation of African Football. All rights reserved. Distributed by AllAfrica Global Media (allAfrica.com). To contact the copyright holder directly for corrections — or for permission to republish or make other authorized use of this material, click here.